Council snoopers - enough is enough! How many times this year have we seen stories of local authorities prying into our lives? First it was Poole Council using anti-terror legislation to spy on a family for weeks just to be sure they sent their child to the school in the right catchment area. Next councils were using the same laws to spy on dog walkers. Now Mid Sussex Council is exposed for having students go through people’s rubbish. Enough is enough already. Who on earth do these petty Town-Hall-Trotsky’s think they are? We pay them – too much as it is – to dispose of our rubbish, not to go through them to see what people are throwing away. Mid Sussex Council claim this was done anonymously so those going through the rubbish didn’t know where it came from. That’s not the case if someone, entirely by accident, has thrown away a phone or utility bill with their name and details on it. Moreover, why should we believe a word these councils say when they routinely use anti-terror legislation to spy on us and won't even tell us what they're doing with the information they get. Gordon Marples is the leader of Mid Sussex Council. You can contact him by phone on 01273 843643 or by email Gordon.marples@midsussex.gov.uk. It is strongly advised if you live in the area to ask him if your rubbish has been taken away and monitored. Furthermore, don’t take any risks. Shred any documents with your name, address and details on before throwing them away. 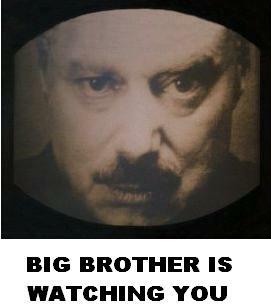 Be sure that these Council bureaucrats don’t get their hands on any information that is yours for your own privacy. Also, please contact Councillor Brian Hall who has led the charge against this abuse of power. You can contact him on 01444 450347 or by email brian.hall@midsussex.gov.uk. I’ll be contacting him to get some more information on this matter that we can pass onto our supporters and if he knows of any other councils willingly intruding into people’s private lives. Finally, it’s worth contacting your councillor to see if your council is taking your rubbish away so it can intrude even further into individual private lives.